Making The Damned – righty-o! Synopsis: A couple driving down to attend their first San Diego Comic-Con befriends a fellow fan hitchhiking to the show. In return for their kind gesture he offers to be their personal guide during the show, and goes as far as promising to help them experience everything on their “must do” list. But with each passing day he grows increasingly obsessed with, and unconventional in, fulfilling his promise, leaving the couple to wonder…. How far will he go to make good on his promise? And what price will they ultimately pay? 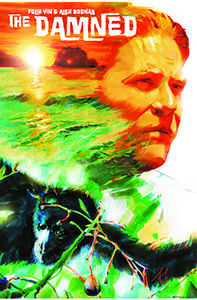 Synopsis: A shipwrecked man wanders an island in search of food to survive. After several days without success he awakens to find fruit and berries by his side. He immediately jumps to the conclusion that there are others humans on the island but eventually discovers his companion is a monkey, which he quickly befriends. Unfortunately, after an unusually stormy night wipes out the vegetation on the island, he doesn’t see the Monkey for days. Then one morning, he awakens to find fruit and berries by his side again, but quickly notices the body of his companion lying in the sand. When he goes to retrieve his friend he is ambushed by other monkeys who capture him with clear intent to use him as food. After agreeing on the “Survivor” story I worked to flesh it out further. I wanted to add detail that could provide Alex a fuller story but that might not be represented directly in the illustrations. Over the course of the next month I would revisit the story for a few hours at a time, resulting in the fourth and final revision below. Synopsis: A shipwrecked survivor of mankind’s self-inflicted Nuclear Apocalypse desperately searches for food in an unknown land. He quickly stumbles upon wild berries, but errs on the side of caution, ultimately turning in for the night on an empty stomach. The next morning he awakens to find an assortment of fruits and nuts by his side. As his body selfishly devours the surprise meal, his mind begins to wonder who is watching out for him. He quickly discovers his savior and soon to be companion is an inquisitive little monkey. In exchange for its kindness, the man gifts the monkey his watch, which he has held onto as a reminder of his humanity, despite it having stopped functioning weeks prior. Full of joy, the monkey leads him into the jungle for what seems like a full days journey across exotic lands. By the early light of the moon, the two arrive at what appears to be the monkey’s home. Once again, the monkey feeds him well and the man has his first good night of rest since becoming shipwrecked. In the morning the man awakens to find the monkey gone. He waits all day for the monkey to return, growing ever more hungry with each passing minute. At dusk the monkey re-emerges from the dense forest carrying something, which the man is eager to sink his teeth into! But he is shocked to be presented with bones wearing his watch! When he realizes his companion has been killed and eaten it’s too late! Descending from above are carnivorous apes intent on following up their appetizer with him as the main course! Though much more descriptive, I wasn’t sure how well Alex could translate this into pages and panels with proper placing of reveals and pacing of the story. 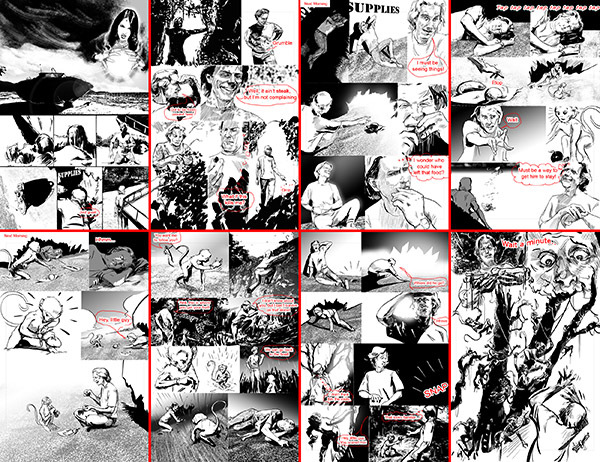 To help him along I provided page breakdowns which he in turn generated thumbnails from. I then turned around and incorporated his comments and thoughts into the next revisions. You can see I struggled with the narrator’s introduction. I wanted it succint with a cliffhanger pun. Ultimately the final version differs from these but they are provided to show how many iterations are made. The point is, don’t spend too much time holding onto ideas and sentences as they will surely be refined through collaboration and an editor. 1 right page title) Top of page with Gypsy introducing story. Version 1: Since the dawn of humanity, man’s path to the top of the food chain has been littered with Mother Nature’s children. But after civilization’s self inflicted nuclear apocalypse, the remaining few souls struggle to survive against Mother Nature’s vengeance. One of these unfortunate souls is Frank Corben who now finds himself shipwrecked, alone and hungry. Will his instincts be enough to save him or will he be the next to join… the Damned! Version 3: Since the dawn of humanity, man had needlessly laid waste to Mother Nature’s children on its journey to the top of the food chain. But civilization’s hunger for power was not satisfied led it to a self-inflicted nuclear apocalypse with the remaining few souls struggling to survive against Mother Nature’s vengeance. Nuclear apocalypse that brought man to near extinction! 2 left page) The next morning he wakes up on the beach thirsty & hungry. He goes looking for food/water and finds berries. But he isn’t sure if they are poisonous so doesn’t eat them and goes hungry the rest of the day. 3 right page) The next morning he wakes up and finds fruit/berries by his side. He is so hungry he devours the food and doesn’t stop to think about who left it until he’s completely stuffed. 5 right page) The next morning the monkey returns with food only to find a small gift waiting for him wrapped in leaves as the man seemingly is sleeping. He unwraps it to find the man’s watch. The monkey realizes that the man is watching him. They eat together (and you see the monkey wearing the watch). After eating, the monkey is eager to show the man something in the jungle. 6 left page) They travel all day on an amazing route (swinging on vines and crossing rivers) and by night reach what seems like the monkey’s make shift home where they eat by the light of the moon and the two fall asleep on one another. 7 right page) The next morning the man wakes up after a good nights rest but the monkey is gone. He looks around and he’s in a densely forested area with very high trees and thick brush. He wonders where the monkey is and waits until dusk when it re-emerges from a bush holding something. The monkey hands the man what looks like a bone (but you can’t see the details because the shot is from the man’s back and you just see the monkey and part of the bone over the man’s shoulder). 8 left page) Large splash image, worms eye view looking up into the tree canopies from the ground. The man is at the bottom (corner?) of the page facing the reader in awe at what he is holding… we see him holding a small skeleton arm and hand with a wristwatch on it… he is unaware of what is descending/leaping out of the trees behind him… a gang of cannibal apes ready for their next meal! Alex’s initial digital thumb nails and my suggestions in color markings. You can see where I planned to place our Gypsy and as well as providing guidance in green as to which pages would be visible together when pages are turned. You can see my notes for the final page include the subject looking towards the reader with a bubble of puzzlement and the indiginous species jumping down from behind. 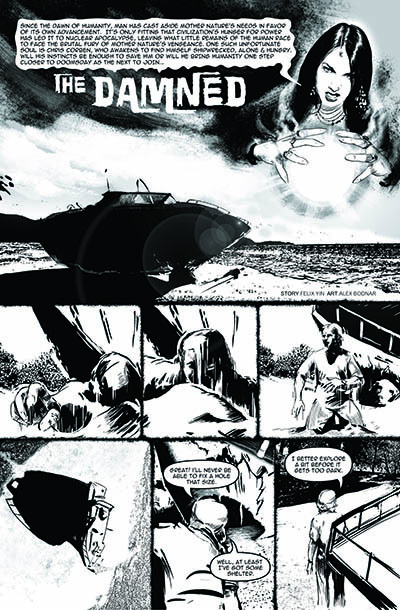 In the final comic book we chose to have the characters facing towards the monkey to provide some immerssiveness from the reader. As the artwork progressed we planned out the location of word balloons. In hindsight we probably could have planned this out a bit better, but were pretty lucky that Alex left space in his artwork to accomodate the words. Below you can see the final page. Notice how we continued to make adjustments as we refined the lettering. 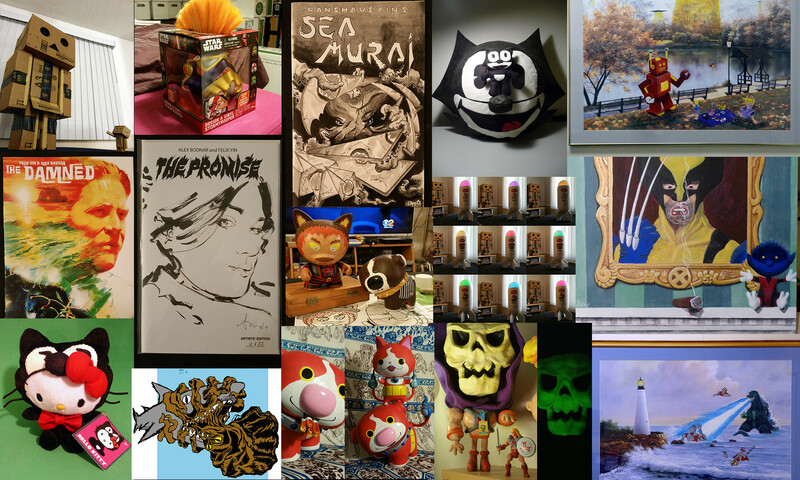 On this story I also added the borders between the frames. Did you notice that I chose to flip the lower left panel? With the story done it was time to work on the cover. Alex is a tremendous watercolor artist. 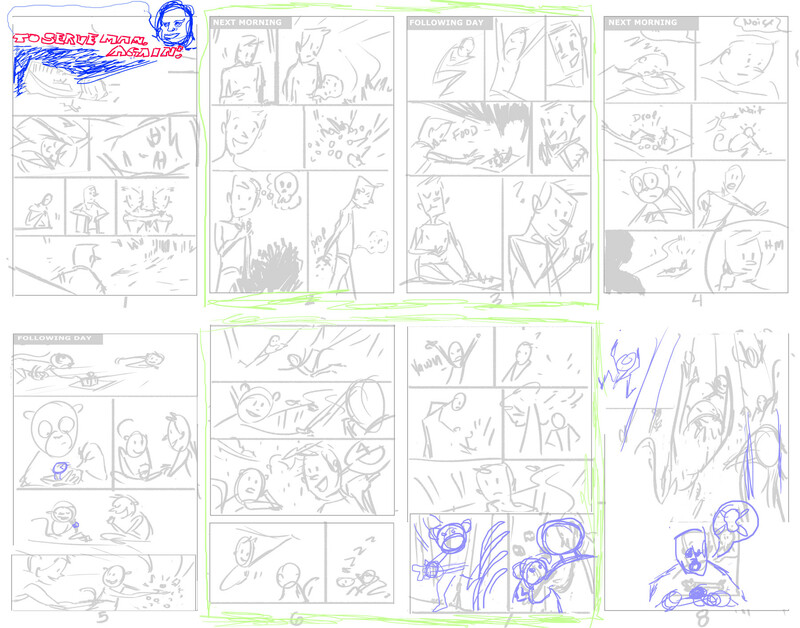 Before putting brush to paper (or in this case I believe Vellum), Alex whipped up a bunch of compositions at thumbnail size. You can see the influence he’s had from movie posters. I particularly like the playfulness he employs working the skull into the composition as a shadow or in the wake left by the boat. 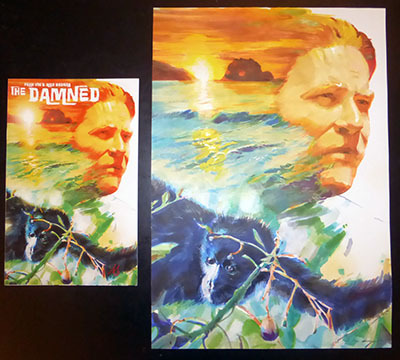 The final cover was done in marker and guache on marker paper, then scanned and digitally modified for contrast. The original art is just under two times as large as the printed comic book. 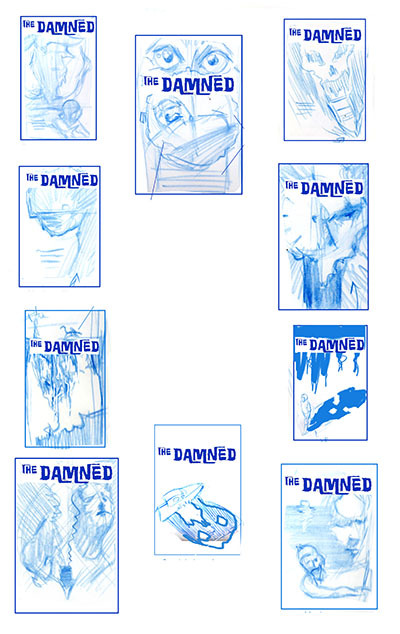 The Damned was self-published as a stand alone comic book in 2016.